Rhoda Barber entries in Jerijah Barber Jr.’s account book, 1801-1810. WHS collections, 1970.6.7, gift of Mr. & Mrs. Kenneth Barber. As a researcher, women are frustrating to follow over time. Often their names change once, or maybe twice, over their lifetime. They do not regularly appear in land records or tax rolls. Many do not leave behind detailed wills and probate papers. Even when we do know of their existence, frequently the only facts we have are birth, marriage, and death dates and the birth dates of their offspring. Being a daughter, wife, and mother were primary roles for early American women. Running a household was a full time job. But what about those years before young women got married and after their children were grown and their husbands were gone? 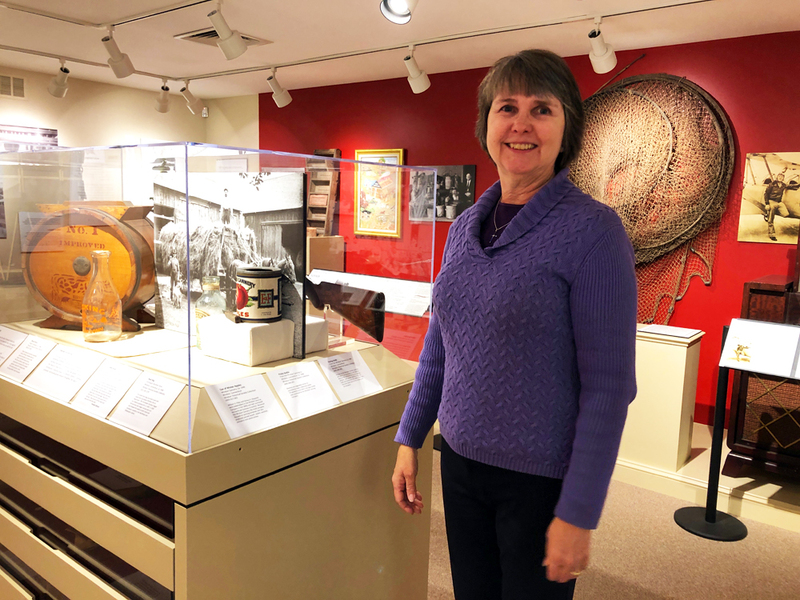 The account books of the Barber family, housed at the Windsor Historical Society since the 1970s, help us shed light on the productive activities of those young women and widows. The Barbers ran a successful tannery, shoemaking shop, and cider mill along Mill Brook in Windsor, at their homestead on what is now Pleasant Street. In the account books of Jerijah Barber, Sr. (1738-1792) and Jerijah Barber, Jr. (1766-1820) from roughly the end of the American Revolution to the War of 1812, forty women appear in accounts with the Barbers. Four of these women were immediate family members, Loanna Barber (1744-1793) and her unmarried daughters, Roxanna, Lucina, and Rhoda Barber. After the death of his father, Jerijah Barber, Jr. kept close account of the family’s expenditures, even charging his mother and sisters for personal and household purchases. Loanna Barber died only a year after her husband, but her son tracked her purchases of pins, pails, a table cloth, alcohol, chocolate, limes, and even 4 pence paid for a comb. The widow paid for these items by making thread, saddle cloths, acquiring wool for the family, and finally out of the balance of her estate after her death. Jerijah kept similarly detailed records of his sisters’ expenses prior to their marriages. Before she married Cyrus Miller in 1795, Roxanna Barber earned credit by making cloth, purchasing items for her baby sister Rhoda, working for the estate, working for their aunt, Naomi Filley, giving up items she had received as inheritance, and assisting her sister Lucina “doing housework 40 weeks.” The bulk of her inheritance was spent on dowry items acquired before her marriage. Lucina Barber’s account reads much the same, with the additional credit for interest on loaned notes and £9/2/0 for “labour done for me doing Housework since April 1st 1795 to September 1796 at which time you went to live at Hartland and Granville.” Jerijah Barber married Deborah Dexter in 1796, and it is perhaps around this time that Lucina moved to Hartland and then Granville where her older, married sisters lived. 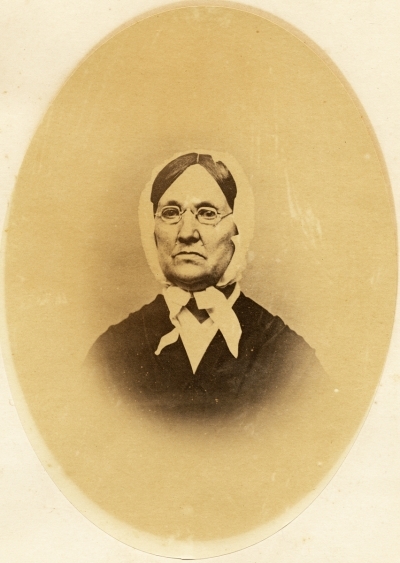 Rhoda Barber Phelps, c.1860s. 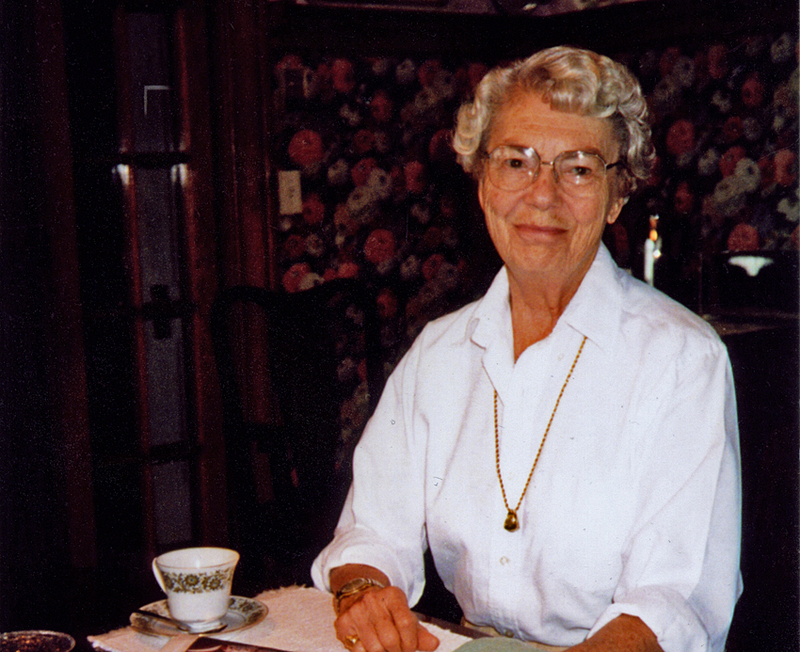 WHS collections 1986.75.508, gift of Marguerite Mills. Rhoda Barber (1783-1864) remained with Jerijah and his wife in Windsor and also spent time at school in Granby and East Windsor. She earned money from interest, “cash received for your keeping school,” and for “labor done in our family since our Father & Mother’s death agreed for the whole time – as you was absent a considerable part of the time & visiting & to work for yourself some part of the time when at Home.” This last credit was valued at £15 (or $50) in October 1803 — the month Rhoda married Roger Phelps — for 10 years of intermittent house work. When and where Rhoda Barber taught school is still a mystery, but these accounting notations help paint a picture of a financially secure young woman seeking out work of her own because she could, not out of necessity. Not all women in Windsor were as fortunate. Widows were in a precarious position in early America. They were not afforded as many property rights as men but still had to make ends meet, oftentimes while raising children. Anna Cook was one such widow in Windsor who had six mouths to feed after her husband, Elisha, drowned in the Farmington River in 1785. She bought shoes, leather, molasses, hay, and rice from Jerijah Barber, Sr. and paid him back with goods such as sheep, corn, a calf, geese feathers, and tow cloth. She also paid with her son’s labor to mow fields and cut brush as well as by paying Barber’s bills to other Windsor merchants. Older widows with adult children were frequently more financially secure and did not need to do manual labor. Widow Deborah Dexter (1743-1830), Jerijah Barber, Jr.’s mother-in-law, still had children at home when her husband, a local sawmill owner, named Seth Dexter, died in 1797. She continued the sawmill operations with her eldest son, David Dexter, for a year and later traded calfskins with her son-in-law for leather, shoes, peas, beans, and flax. By keeping accounts of their own, these older widows were able to maintain some level of independence. Unmarried women in Windsor were similarly free to work, earn money, and help support their families. Eunice Eno (1746-1818), the unmarried daughter of Samuel and Eunice Marshall Eno, made clothing and alterations for Jerijah Barber, Sr. In September and October 1791, she made a jacket and breeches, two great coats, two pairs of “trowsers,” and a pair of drawers, altered a coat, vest, and breeches, and worked for three half-days for the Barbers. Her efforts were compensated for with leather, shoes, and remnants of cloth valued at £2/0/10. In 1799, a Mary Kent of Suffield earned only slightly more, £2/9/4, for “12 weeks and 2 days work @ 4 [shillings] pr week.” Those three months of wages were most likely for assisting the Barbers with house work. Also in 1799, Jerijah Barber credited Elizabeth (or Betsy) Allyn of Windsor £12/7/6 for 82½ weeks of work for the Barbers, but very little of that was paid in cash. Betsy received most of her payment in the form of shoes, accessories, fabric, and clothing. An Anne Allyn settled Betsy’s account with Barber in 1801, implying that Betsy was still a minor at the time, but Betsy Allyn continued to work for the Barbers until 1804. Betsy Allyn entries, 1799. WHS collections, 1970.6.9. Most of the young women doing housework for the Barbers received 4 shillings and 6 pence a week for their labor. 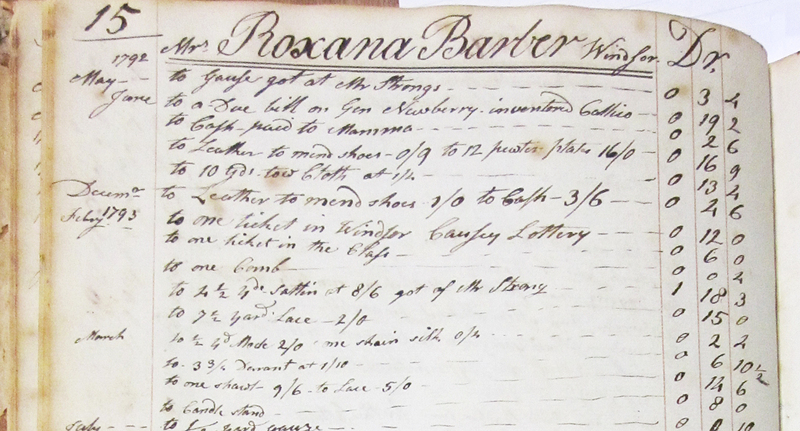 Most business was conducted in American dollars and cents by the early 1800s, and Jerijah Barber’s account book for 1801 to 1812 shows his transition from British to American currency. In 1809, Miss Hannah Holcomb of Windsor worked for the Barbers for 4 weeks and 2 days, at the rate of 4/6 per week, earning a total of $3.25. By comparison, Barber paid his journeyman, William Loomis the second $12 per month in the same year. Other women working for the Barbers over the years included Miss Rutha (or Ruthy) Barber, Miss Nancy Dexter, Miss Mary Griffin, Miss Rhoda Hossenton, Miss Eleanor Loomis, Miss Roxanna Loomis, Mrs. Sarah Stanley, Esther Thorp, Miss Sarah (or Sally) Thorp, Tirzah Thorp, and Suley Westland, all of Windsor. Not all the young women in the Barber accounts worked for the family for lengthy periods. Eunice Brown (b. 1781), the daughter of Barber’s neighbor Stephen Brown, exchanged her “three days washing” in August 1798 for “coppy plates” and flax, valued at 3 shillings. Seven years later, her younger sister Rebekah (b. 1786) helped with the washing 22 times and made soap for the Barbers for 2 days. For her compensation, Barber gave her 14 pounds of wool valued at £1/8/0. In 1802, Clarissa Cook (b. 1782) brought Barber a 46-pound animal hide, and he paid her 13 shillings and 5 pence in cash. Miss Laura Griswold (1787-1874) of Windsor was in a different position when she lent Barber £50 ($166.67) in 1811. In return, she received cash repaid over time, shoes, and fabric. While she later worked in the Barbers’ home for two and a half years before marrying Hiram Phelps, how Miss Griswold amassed such an initial sum to lend to Barber is not yet known. What is known is that these account books provide a wider picture as to how women in Windsor interacted in the community, supported themselves and their families, and contributed to the economic foundations of our town, state, and country. But more research is necessary into the lives and livelihoods of these women. Later account books from the Barbers should reveal even more names and more types of fiscal interactions. And of course the Society’s whole account book collection is much larger and continues to grow. A thorough review of all of it could help us craft a true picture of the lives of working women in Windsor across time and allow us to draw real comparisons to today’s female workforce.